A Sears executive at the Mobile First Look Strategy 2012 conference yesterday said 7 out of 10 smartphone owners have either shopped or browsed on their mobile device, proving that mobile is an opportunity for retailers to drive sales. Mobile is changing constantly and marketing strategies need to adapt to that. “Customers want the best of both worlds, they want all the pluses you get out of digital and the ability to socialize. They also want to see the best of the physical world – the ability to touch. That’s what mass merchants and retailers need to do – bring those two things together” said Imran Jooma, president of ecommerce at Sears. Mobile is changing and marketers and retailers need to embrace technology. “The mobile device serves as a glue to bring in the physical and digital world together, we must elevate the experience ” Mr. Jooma said. As the mobile space evolves, due in part by the intersection of social, the role of SMS as a marketing vehicle is expanding. Retailers and brands should be incorporating SMS into their mobile commerce sites to let consumers share and recommend a product they are viewing from their device via text message. 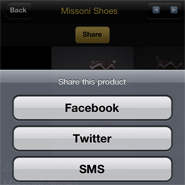 Brands such as Gilt Groupe, Amazon, Best Buy and Target are encouraging their existing and potential customers to share via an SMS feature within their commerce-enabled mobile sites. “When compared to a particular product message coming directly from a brand or retailer, as it usually does, the message is more powerful in two ways. First, the product is coming from someone the recipient knows personally and trusts. Second, that person might know the recipient’s tastes and be sharing the product because she thinks it will be something her friend will like. For those reasons, it is probably the most likely to get a recipient’s attention” said Doug Wick, director of product marketing at Digby, Austin.